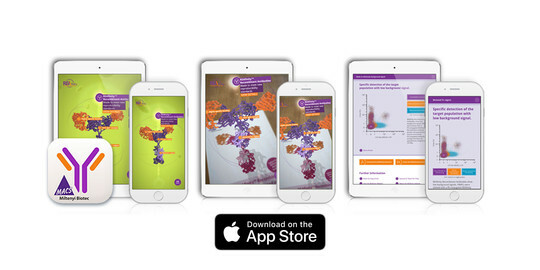 The Miltenyi Biotec augmented reality (AR) mobile app is designed to help you explore the unique features of recombinant antibodies and learn about their advantages for flow cytometry. 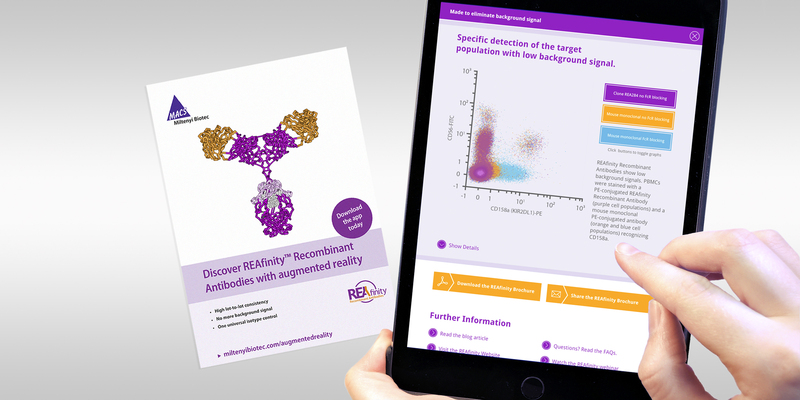 Scan the flyer and explore an augmented 3D REAfinity Antibody. With approximately 10 nm in size, it´s hard to see all the innovative features that are built into our REAfinity™ Recombinant Antibodies. That´s why we've developed an augmented reality app that helps you explore these fascinating molecules on your mobile devices*. 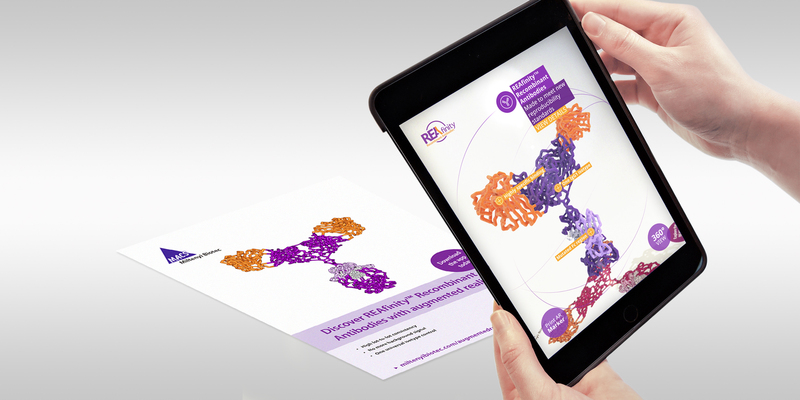 Download the app from the Apple® App Store, print the flyer, scan the antibody, and start exploring. * Currently only available on Apple® devices. Start the app, select “AR View”, and scan the flyer with your mobile device. The antibody itself can be displayed in a variety of ways. You can touch, rotate, and zoom in on the antibody to discover individual areas. By clicking on individual features you will find detailed background information. See detailed explanations and data examples for the unique features. Interactive dot plots help to compare differences in performance between conventional hybridoma-derived and recombinant antibodies. © 2018 Apple Inc. All rights reserved. Apple, the Apple logo, Apple TV, Apple Watch, iPad, iPhone, iPod, iPod touch, iTunes, the iTunes logo, Mac, iMac, MacBook, MacBook Pro, MacBook Air, macOS, and QuickTime are trademarks of Apple Inc., registered in the U.S. and other countries. Multi-Touch is a trademark of Apple Inc. App Store is a service mark of Apple Inc., registered in the U.S. and other countries. IOS is a trademark or registered trademark of Cisco in the U.S. and other countries and is used under license. Other product and company names mentioned herein may be trademarks of their respective companies.